By the Nazareth’s The Gomesi or Busuuti (as the dress is alternatively known) is the defacto national dress of Uganda. It is an elegant and colourful floorlength dress. However, up to now anyone who peruses through the web for the origins of the dress would be unclear as to when it was designed - dates vary between 1905 and the 1940s - and who exactly designed it other than it was a man called Gomes. When Ella and John Gomes asked me to write an article about the Gomesi and the part played by their father, Caetano Milagres Gomes (CM), I thought that it was all quite straightforward. Instead, it turned out to be a detective story and the process of finding out turned out to be quite exciting. So come and journey with me. When was it designed and by whom? The story starts out with the birth of Gayaza High School1 in 1905 and Miss Alfreda Allen, the Headmistress asking a tailor, Mr. Gomes to design a uniform for her girls. Reading through an article based on an interview with CM Gomes2, he appeared to be unclear about whether it was he or his elder brother Anton Gloria Gomes (AG), both of whom were working together, who designed the dress. CM recalled that it was his elder brother AG who talked to Miss Allen as AG was already stitching uniforms for Gayaza when CM first came to Kampala to join his brother in 1908. But in that same interview his memory gave indirect clues as to when and how the dress came to be. So the earliest that the Gomesi could have been designed was in 1905 as that was when Gayaza High School opened. However, Gayaza first used the “suuka”3 4made of bark-cloth as a school dress in 1905. Furthermore AG Gomes first came to Uganda from Goa India in 1905 as well, and would have just started his tailoring business, so it is unlikely that it was designed then. Sometime between 1905 and 1908 Ms Allen approached AG Gomes to make a “suuka” of cotton as it was more durable. The next phase came to resolve the problem of the “suuka” unraveling when the students were doing manual work, so Miss Allen sought a better design to preserve the modesty of the pupils5. AG did that by adding a yoke to the design6. In the interview7 with CM Gomes, he recalled clearly that the Gomesi did not become popular with the masses until the wife of Kabaka Daudi Chwa II wore it for the Kabaka’s coronation – and it was he that had stitched her dress. That the Kabaka’s future wife, Irene Drusilla Namaganda, came to Gomes to stitch her dress was not as surprising as it may seem at first. According to Cox et al “… and when the Kabaka was looking for a wife, it was to Gayaza that he came …”8 As a former student of Gayaza, Miss Namaganda would have known the Gomes brothers well. The Gomesi has some aspects of Victorian/Edwardian dresses (those puffed sleeves) and some aspects of the sari that Gomes was familiar with from his homeland – Goa, India. A sash was also added around the waist to accentuate the feminine figure. The embellishment of the original school uniform would only make sense - if the Kabaka’s queen was going to use it, CM wanted something special. Kabaka Chwa’s coronation took place in 1914 and hence it is this year that should be honoured as the birth-year of the Gomesi. So the design of the dress came about because history brought together the Gomes brothers, Miss Allen and Miss Namaganda – and CM Gomes had the honour of stitching that first dress. It is possible that the design evolved further after 1914. 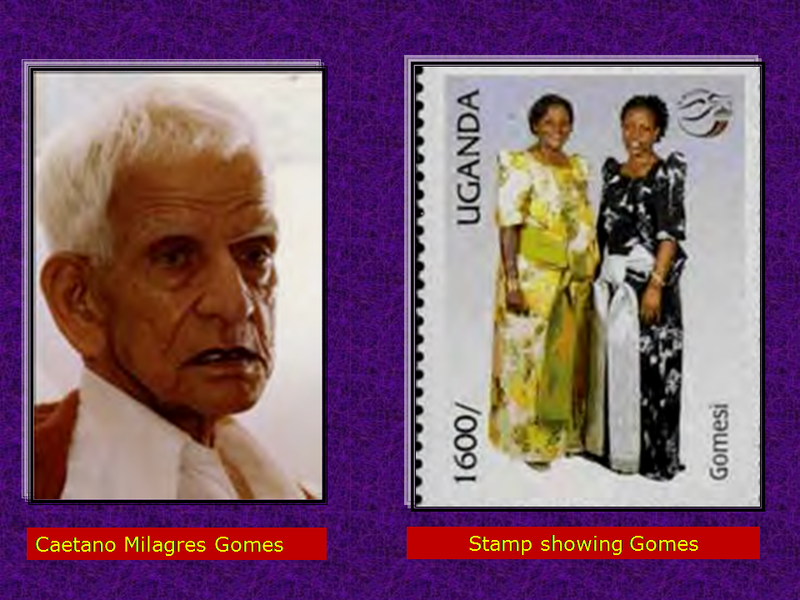 The Gomes Brothers and Their Descendants A short history of the Gomes’ Tailors shop - AG Gomes came to Uganda in 1905 and started a tailoring business in the corner of a store in the district of Mengo. In 1908, after CM Gomes joined his brother, a store was opened under the sign-board “A.G. Gomes & Brother”. AG Gomes died in 1928, leaving the business and his three children in the care of his brother CM Gomes. AG’s wife also died suddenly, three months after her husband. Gayaza’s uniforms were all stitched at the store for many years. In 1918, the store moved to Kampala Road. REFERENCES 1 Gayaza High School was formed as a boarding school for girls by Anglican lay missionaries 2 A short interview by the Uganda Argus with Mr. CM Gomes in December 1967 3 “Gayaza High School – The First Ninety Years” – Edited by Joan Cox, Brenda Richards and Sheelagh Warren 4 Also, interesting letter by Mr. S. J. Luyimbazi-Zake’s letter to Uganda Argus in December 1967 5 Ibid Footnote 3. 6 According to Ella Gomes, this is what her father told her 7 Ibid Footnote ii plus recollections from Ella and John Gomes 8 Ibid Footnote 3.